If you live in Brampton, you probably need a car to get around. And that’s where our car loan service can help: we connect car buyers with the financing they need to buy a vehicle. Even if they have bad credit or no credit. Get a loan in Brampton even with bad credit or no credit. Find the best auto loan rates in Brampton. How do I qualify for a car loan in Brampton? I just moved to Brampton from another country. Can I get a car loan? Yes. We’ll help you get a car loan even if you don’t have a Canadian credit history. Just make sure you meet our lending requirements (see above), and we’ll set you up with vehicle financing from a dealer in our car loan network. Do I need to provide any detailed personal information to apply for an auto loan? No. We just need some basic contact information, as well as a few details on where you live and work. We do not require personal information like your social insurance number or credit history. Why should I choose a shorter car loan? By going with a shorter car loan term, your monthly payments will be higher, but the amount of interest you’ll be charged over the life of the loan will be far less. Once I’m approved for a car loan, can I shop at multiple dealerships in Brampton and the GTA? No. With our car loan service, you can only buy a vehicle from the dealership offering you the financing. How do I know if I’m “buying too much car”? The increasing popularity of longer auto loans is leading many Canadians to purchase more expensive vehicles. 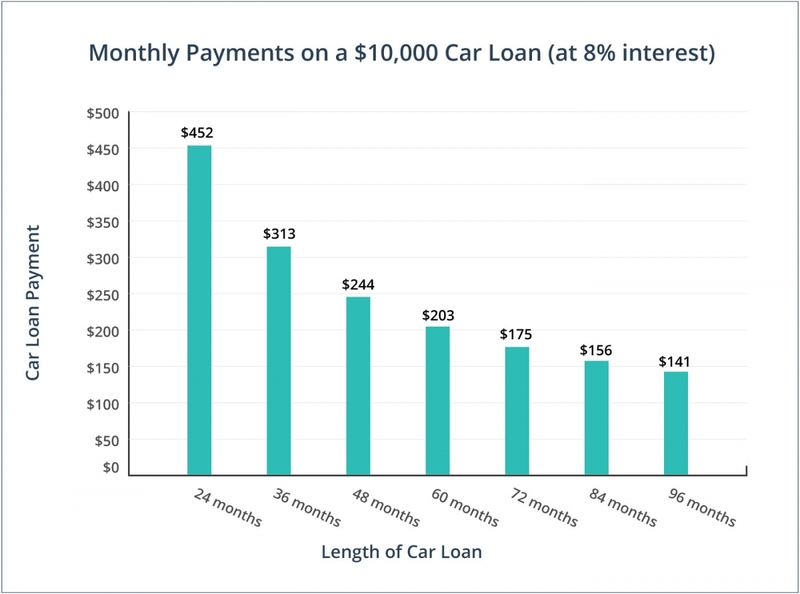 Longer loans result in lower monthly payments, which entices some buyers to spend more money on a vehicle than they otherwise would. Here’s an example: the monthly payments on a $12,000, 36-month car loan would be roughly the same as on a $24,000, 72-month loan. What some buyers forget is that they’ll be paying off the more expensive vehicle for an additional 3 years, during which time they’ll still be charged interest and will need to pay for all the repairs and maintenance that older vehicles require. We encourage car buyers in Brampton (and everywhere else) to follow this simple rule: if you can only afford the vehicle you’re interested in by taking a really long car loan term, then it’s probably too expensive. How does my car loan term affect my payments? As mentioned above, longer loan terms will mean smaller monthly payments, but the amount of interest you pay will be much higher. If you can get by with a shorter term, it’s a good idea to consider one. If you’re not able to afford a higher monthly payment, then a longer term will reduce the strain on your pocketbook from month to month. Take a look at the graph below for a better understanding of how different loan lengths change your monthly payments. While your monthly car loan payments will be higher, a shorter loan term will save you money on interest and get you out of debt sooner. The Motor Vehicle Dealers Act and the Consumer Protection Act give you legal rights and protections when you purchase your car through a registered dealership. Make sure you test the vehicle you’re considering purchasing. This should be done in daylight and should include a variety of roadways. Make sure you operate the vehicle at highway speeds too: the 410 and 401 are good options for testing your car’s performance at 100 km/h in Brampton. Being underwater on your car loan happens when the market value of your vehicle is less than what is still owed on your loan. Avoid this situation by not spending a large sum on a vehicle that's depreciating rapidly and by taking a shorter loan that you can pay off more quickly. Registered dealerships aren’t required to advertise all-in pricing. False. According to the Ontario Motor Vehicle Industry Council, the Motor Vehicle Dealers Act requires registered dealers to include all fees and charges in their advertised prices. This does not include HST or a one-time license fee. There’s a “cooling off” period after signing a purchase agreement. False. In Brampton, as well as the rest of Ontario, there's no “cooling off” period after signing a purchase agreement. Be sure to read all documents carefully and ask for clarification if needed. Registered dealerships don’t have to disclose if a vehicle was used as a rental or taxi. False. Registered dealerships in Brampton have to tell you if a vehicle was part of a rental or taxi fleet. It’s the law. I can choose the vehicle I want to purchase before I get a car loan through your site. False. When you use LowestRates.ca, you have to apply for a loan first, get matched with a dealership in Brampton, and then confirm the details of your financing. Once this process is complete, you can shop for a car on the dealer’s lot. The Financial Consumer Agency of Canada says that the average loan length in Canada has increased by 2 months every year since 2010, reaching 74 months in 2015. According to Statistics Canada, new car sales rose in Ontario by 9.1% from June 2015 to June 2016. Registered dealerships must disclose key information, such as vehicle make, model, mileage, and year, prior to completing a sale. There are charging stations a’plenty in Brampton. The city plans to have a total of 32 electric vehicle charging stations in place by the end of 2016.